In Hoizon, the supplement with The Assam Tribune, dated Friday 19 August 2016, Shyamanta Das, Editor-in-Chief of the Open Journal of Psychiatry & Allied Sciences (OJPAS™) in his Mind Matters column, “Of sexualities and stigmas” reviewed the commentary, “Homosexuality: how therapists can help?” by Mudassir Hassan published in OJPAS™. Shyamanta Das, Editor-in-Chief of the Open Journal of Psychiatry & Allied Sciences (OJPAS™) talked on “Renaming childhood psychiatric disorders: work in progress” in an interactive session with the doctors from the Lokopriya Gopinath Bordoloi Regional Institute of Mental Health (LGBRIMH). 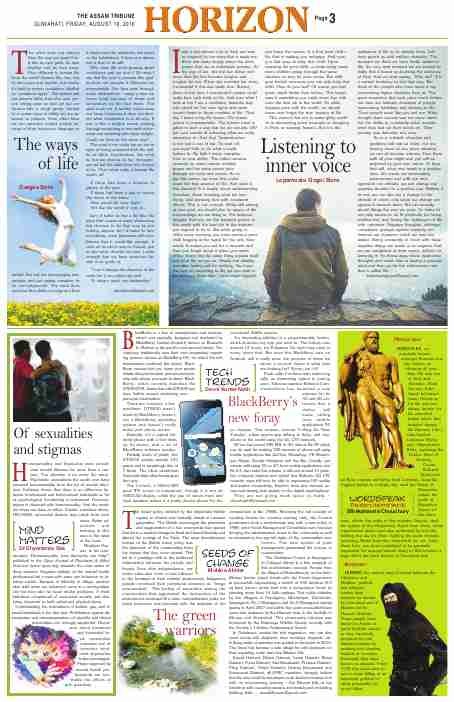 In this week’s Horizon (Friday 5 August 2016), the supplement with The Assam Tribune, Shyamanta Das, Editor-in-Chief of the Open Journal of Psychiatry & Allied Sciences (OJPAS™) in his Mind Matters column, titled “Sexual experience” reviewed the Case Report, “Anubhoothi: a psychopathology of unusual sexual experience” by G Ragesh, Gopalkumar Rakesh, Ameer Hamza, Manoj Kumar Sharma, and Santosh K Chaturvedi that was published in OJPAS™.